We can only hope, but here is what makes the data interesting this year for 2012 and the actual numbers start getting published and we all start making something out of the numbers that we see. Of course we have to use the numbers from Comichron as our definitive source, other numbers will vary, but this is the same number set that we used last year to try to gauge where the comic book market was going, and it was getting to be pretty depressing towards the end of 2011. Over the 2012 year we saw a couple of hundred comic book stores close down, and a number of online smaller sellers on Amazon and Ebay get out of the comic book market. Surprisingly with the closure of both online and brick and mortar stores, it looks like the numbers creeped up last year. Meaning people are buying, you just have to be careful what you sell to survive anywhere in the comic book industry. But here are what the numbers look like. And some handy charts to help you along with your day. 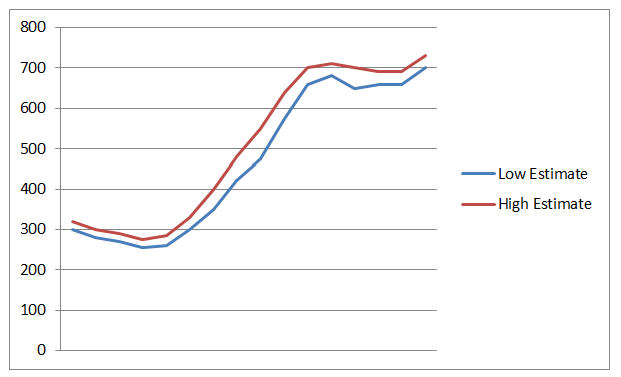 Year by High/Low Estimates of sales 1997 to 2012 based on Comichron data, Estimated overall North American Market size, including estimates for newsstand comics and bookstore TPB sales. So obviously we sold a lot of stuff, to a lot of people, or a lot of stuff to a small number of people. I don’t know where the money is coming from, but obviously people had it, and spent it on comics. 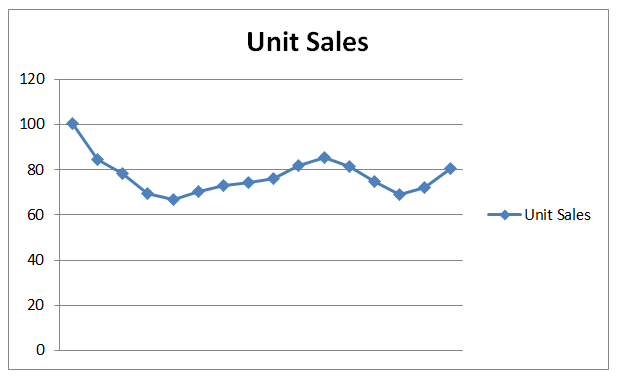 Unit Sales 1997 to 2012 – Unit Sales for Diamond’s Top 300 Comic Books from each month over the year. Year to Year data is totally more awesome to look at, and while we are not up to 1997 levels, at least the downward trend has chilled out. So making much of nothing probably, while not at the 100 million in unit sales, we at least topped over 80 million and that makes life totally interesting for people who are in the industry, or want to get into the industry and open a comic book store. This does not include digital, downloads, or other data, just diamond data. If we could get good reliable digital sales data that would be awesome, and would totally change the data in these charts. Overall though it looks like people are spending money, but I think they are being much more careful about what they spend. The sad part is that the online environment has become a dumping ground for comics that won’t sell in a store, prices have drastically declined in the online world, and a number of mid-sized players simply pulled out or changed their business model. There are still a good number of comic book sellers online that are doing well, but if you were marginal in 2010 and 2011, 2012 was simply not your year to be in the business. Odds are highly likely you closed your doors because you could not compete with other larger discount chains online. How you brick and mortar stores are staying alive I have no idea, but if you want to talk about it, drop us a note, we would love to hear your stories.